Imagine completing your Kailash Mansarovar Yatra By Helicopter in just 9 days – without any physical hardship and in the swiftest possible manner. It’s possible with Comfortmytravel. A passionate devotee of Lord Shiva with a profound desire to catch sight of and pay tribute at Mount Kailash and Kailash Manasarovar, yet, unaccomplished because of the absence of time can be finished at this point. Kailash Mansarovar Yatra by helicopter makes your long pending wish of visiting Kailash Mansarovar simple and easy and you can complete it in an easier way. No need to take the treacherous road route choked with traffic. We’ll fly you to Simikot on an aircraft and transfer you to connecting flight to Hilsa. We would like to thank Hon’ble Chief Minister of Uttar Pradesh, Shri Yogi Adityanath for his sheer contribution in providing a Kailash Mansarovar yatra subsidy of ₹1 Lakh to all the pilgrims of Uttar Pradesh traveling to Lake Mansarovar. Online subsidy application can be submitted on Dharmarth Karya, Uttar Pradesh Government website. This effort will encourage many devotees to go to the pilgrimage & enrich their soul with divine power and spirituality. Comfort My Travel offer some great Kailash Mansarovar yatra helicopter services to you. Arrive at 9:00 AM at a designated point in Lucknow where our company team will welcome you and brief you about the trip. Start the travel from Lucknow to Nepalgunj at 10:00 AM. You are requested to reach the designated spot well within time. A wholesome vegetarian lunch will be served by Comfortmytravel team at the guesthouse/hotel in Nepalgunj. Post lunch, you will be introduced to your co-travelers who will be starting their trip from Nepalgunj. A briefing session will be conducted during the evening, at your guide’s discretion. You will be spending the night at the guesthouse/hotel in Nepalgunj. A sumptuous dinner will be served to wind off an eventful day. After an early piping hot breakfast, you will proceed towards Nepalgunj airport where you will board the scheduled flight to Simikot (fixed wing aircraft). On arrival at Simikot, a chartered helicopter will ferry the group to Hilsa. This town has a non-metallic air-strip. From Hilsa you will be taken to the Tibetan city in 45min through a bus, escorted by our Sherpa team. Once you complete your custom and immigration formalities at Sher, our vehicles (jeep/bus/van) will take you to Taklakot. At Taklakot (Burang), you will be checked into a comfortable hotel for a relaxed, night halt. Relax in your in your hotel room in Taklakot as you physically, mentally and spiritually prepare yourself for the journey of your life – your pilgrimage to Mount Kailash Mansarovar. If inclined, you can take a short trek/walk or visit the local markets an hour before you commence your yatra. This is the D day when you will be embarking on Mount Kailash Yatra. You are about to have your first Darshan of the Holiest of the Holy Mansarovar Lake. After breakfast the group will march to Chui Gompa (Altitude: 4560 m) by road, negotiating the undulating, picturesque terrain via Rakshas Taal. Once there, you can take a quick dip into the Holy Lake, do your puja. Havan is usually done on full moon nights and Comfortmytravel will pick this day to ensure that this would be a full moon date on the Hindu almanac. Depending on the availability of time, a visit to the Hot Spring would be arranged in the evening. You will be spending the night at a beautiful guest house near Lake Mansarovar. After breakfast at Mansarovar, the group will travel to Tarboche (Shershong), which is 35 kms drive away. On the way, we will cross the Yama Dwar, the gate to the Kingdom of the Gods. At Tarboche, you will get to meet the Yak and the Yak men. This would be the starting point of your Parikrama and the first day of Kora. Here, you can hire a Yak and a porter to carry your luggage for you, if you like. During the trek to Dirapuk you will have your first darshan of Holy Mt. Kailash (North face). You will be spending the night at our beautifully-done camp at Dirapuk. A Satvik hot dinner would be served at the campsite to our guests. Important note: Yatris who do not wish to take up the Mt. Kailash Parikrama will be requested to return to Darchen from this spot. During your wait for the return of the other yatris, you will be accommodated at our guesthouse to make your stay as comfortable as possible. Yak Charges and porter charges are not included in the package. You can start your morning with a stunning view of the Mount Kailash. After breakfast, you would be asked to begin your trek uphill towards Zuthulphuk. As a forewarning, we must tell you that this trek is not going to be an easy one, so please prepare yourself both physically and mentally. But if you bear in mind that this is a pilgrimage of a lifetime, you can successfully undertake it. 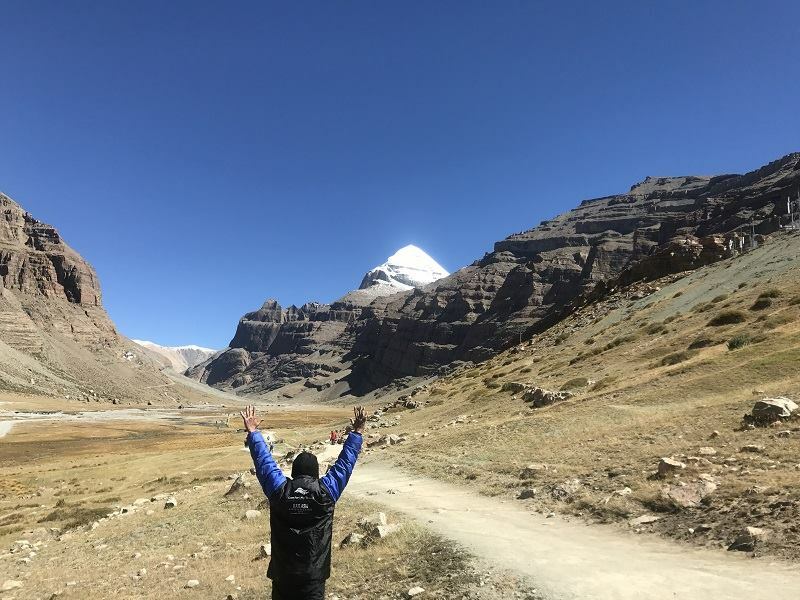 Trekking under the Holy Mount Kailash, you will reach the Drolma La pass (5800 m), which is the highest point of the trek to Mount Kailash. This trek is going to be a little rocky and steep, so you must be in a fit condition. From the Drolma La Pass, we will descend towards the gradual undulating field of Zuthulphuk. As you move down, on a clear morning, you will be blessed with the Darshan of Gauri Kunda. The walk becomes pleasant and relaxing from the valley below, with gentle slopes over the grassy fields. At Zuthulphuk, you can relax, soak in the breath-taking view around you and spend the nippy night at our pleasant guesthouse/camp that would be kept warm for you. After breakfast, at the guesthouse/camp, you would want to while away your morning time in solitude, exploring the caves and visiting the temple and shrines of Zuthulphuk, as per your wishes. An old, married couple supervises the temple here, which houses about half a dozen Tibetan devotees and helpers who maintain the building in a Spartan condition. You will see meditation platforms in the cave that are deeply inviting. It is worthwhile climbing up to these caves before you end your final trek to the holy Kailash Mount. After a 10 km walk (4-5 hours) you will reach the final destination of your trek near Darchen. Here you will re-unite with the pilgrims, who could not do the Parikarma. From here our vehicles will take you to the hotel in Taklakot for a restful, overnight stay. This would be the last leg of your trek that can quickly be completed in three to four hours, so you can wake up at your regular time before beginning your descent downhill towards the Darchen town. From there, you will be picked up and transported to Comfortmytravel’s Guest House at Darchen, where the other group members will be waiting for you. Once there, you will continue your journey to Taklakot, completing the remaining course of Lake Mansarovar Parikrama by road on a vehicle. You can relax and spend the night at our Taklakot Guest House. Note: If you wish you can fill a bottle with the holy water of Lake Mansarovar so that you can carry the blessings of Lord Shiva home with you. Congratulations! You have completed your Kailash Mansarovar Yatra. After an early breakfast at Taklakot, you will be driven towards China-Nepal border (22 kms). The border will have to be crossed on foot. After completing all the immigration formalities at the border, you will proceed towards Hilsa (Nepal side). From Hilsa you will take a 25-minute Helicopter ride back to Simikot, where you will take another connecting flight to Nepalgunj. From Nepalgunj, you will drive straight into Lucknow. 3. The additional cost of Accommodation & Transport on early return due to personal/ or natural problem. 4. Nepal Re-entry Visa fee for NRI. Kailash Mansarovar Yatra by Helicopter Ex Lucknow 2019. Tour starts from 22th April 2019.